One-of-a-kind, custom built, pine logs from Paisley, hand milled Alder cupboards and doors, granite counter tops, terracotta tiles & vinyl plank floors, knotty pine tongue & groove 18' vaulted ceiling, lge walk-in shower w/hand painted custom made tile from Mexico, triangular soak tub w/ceramic tile surround, walk-in closet, finished loft with drop down stairs, heavy duty poured foundation & footings, dbl pane windows, wood stove in house & in 392 sq. ft guest qtrs. built to home standards inside 1008 sq. ft. pole building shop w/garage door openers, 10' ceiling. Home & shop feature heavy raised seam metal roofing. 8'x10' garden storage shed. Well in pump house 120' deep 20 GPM. 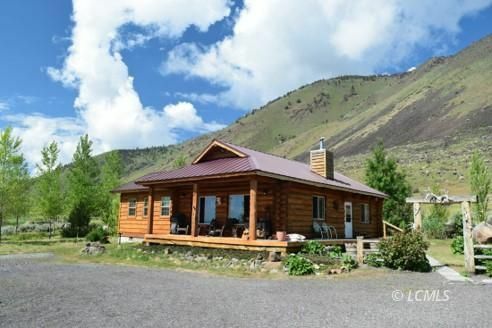 80 established trees, perennial flowers, berries and fruit trees, horseshoe pit, shooting bench, concrete hot tub pad w/power, RV plug-in w/sewer & water at hand. Circular gravel drive. All appliances stay. Hunting, hiking, rock hounding, birding. New addition 2nd bedroom just added 2017. Fenced and gated.